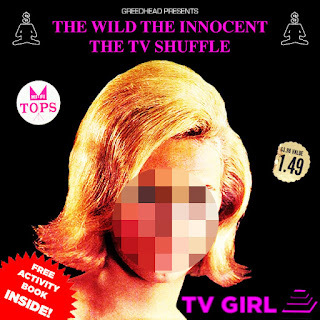 San Diego-based indie-pop duo TV Girl return with their new nostalgia-laced mixtape The Wild, The Innocent, The TV Shuffle, released today as a free download from Greedhead Music, the label run by Himanshu Suri of Das Racist. The 15-track mixtape even comes with a sarcastically humorous activity book .pdf with puzzles, coloring pages, games and recipes for you to enjoy while you listen to the mixtape. The unsigned band is planning to make a break from their norm with this last, long love letter to their sample-loving ways. But their debut album/mixtape and follow-up to their excellent Benny And The Jetts EP (released last August), features their sample-heavy sound that blends drum breaks and doo-wop and synths both sparkling and hazy with 60's psychedelia into a retro-fitted modern mix that is infectiously catchy and dancable. This is summer music all the way! Great Apes - "Sam's Song" 7"